Rear Axle Differential Carrier 3.42 Ratio Gu6 24238614 Oem Chevrolet Corvette Z06 C6 2006-08; crack At Mount. CORVETTE 06-08 Z06 (MT, 3.42 ratio opt GU6). To see all CHEVY CORVETTE parts that we have in Inventory. New old stock seal #15583783. Wisconsin buyers pay 5.5% sales tax. USA Standard Gear’s differential rebuild kits feature high-quality Koyo bearings and races plus all of the required hardware to make your differential function like new again. "USA Standard Gear Differential Rebuild Kit --. Important Note To the port of your city. "USA Standard Gear Ring and Pinion --. Pinion spline count : 19. You can choose from an extensive selection of ring and pinions from USA Standard Gear to build the differential you want. USA STANDARD GEAR – RING AND PINIONS. 1968-1979 (From 76) C3 Chevrolet Corvette Differential Cross Member Mount. This had quite a bit of surface rust that left pitting. A majority of it was brushed off. There is still pitting and surface flaws but no rust through. Does not include mounting hardware. It has been painted black to prevent further rust. Comes as shown. YUKON GEAR & AXLE RING AND PINION GEAR SETS. "Yukon Gear & Axle Ring and Pinion --. Regain lost power from oversized tires by installing a higher ratio ring and pinion. Pinion spline count : 17. Available in popular gear ratios. , We are in Stuart Florida. Looking for hard to find 84-96 Corvette interior or exterior used ORIGINAL GM screws, bolts, nuts?. CORVETTE 15-16 Z06, AT. To see all CHEVY CORVETTE parts that we have in Inventory. This Part is from a 15 CHEVY CORVETTE. Model: 15 CHEVY CORVETTE. Happy viewing! Koyo Quality Master Overhaul Bearing Rebuild Kit DANA 44. You need to make sure your vehicle has a 10 bolt cover, and inside is an DANA 44. It will give you a good idea, but you need to make sure this kit is a match. Notes : D44HD(HD ONLY!). YUKON GEAR & AXLE RING AND PINION GEAR SETS. "Yukon Gear & Axle Ring and Pinion --. Regain lost power from oversized tires by installing a higher ratio ring and pinion. Pinion spline count : 30. "Yukon Gear & Axle Yoke --. YUKON GEAR & AXLE – YOKES. Notes U-Bolt Style, Location : Rear. Location : Rear. Condition : New. Therefore all implied warranties that may apply to your part are limited to the duration of this written warranty. UP FOR SALE IS THIS IS A HARD TO FIND EXTRA NICE REAR END CASE FOR A POSI-TRACTION REAR END FOR A 1959 CORVETTE OR CHEVROLET. IT IS DATED H138 [ AUGUST 13TH 1958 ]. IT HAS THE POSI-TRATION. Condition: 86k. CORVETTE 84. Model: CHEVY CORVETTE. CORVETTE 85-87 AT. Carrier Assembly. Again, we DO NOT WARRANTY LABOR. In the event of a defect, promptly notify All Auto Parts. This limited warranty is void if the part is taken apart or modified. Genuine GM NOS 1965-1972 Chevelle Camaro Nova Corvette Positraction Carrier Spring Plates. Genuine GM NOS Eaton Posi Carrier Spring Plates. Note: Eaton Posi Carrier Only. 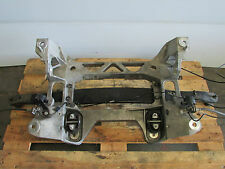 Fits Chevrolet 10 & 12 Bolt Rear Differentials. To see all CHEVY CORVETTE parts that we have in Inventory. This Part is from a 14 CHEVY CORVETTE. CORVETTE 14 Base, AT. Model: 14 CHEVY CORVETTE. Happy viewing! "Yukon Gear & Axle Spider Gear Kit --. YUKON GEAR & AXLE – SPIDER GEAR KITS. Includes : Two Side Gears, Four Pinion Gears, Cross Pin Shaft, Roll Pin and Spider Gear Thrust Washers. Quantity sold : Kit. 84-96 Chevy Corvette C4 5.7L AT Rear Differential 2.59 Limited Slip 104k miles! 1986 Chevrolet Corvette 5.7L AT. If you don't want any surprises - keep in touch with the transporter yourself. Be sure for what you buy! - it is an electronic part in good condition. - don’t need it any more;. GEAR RATIO 3:15 GM PART NUMBER 12556313. GOOD USED REAR DIFFERENTIAL FROM A 1999 CORVETTE. FITS 1997-2004 WITH AUTOMATIC TRANSMISSION AND 3:15 GEAR RATIO. "USA Standard Gear Ring and Pinion --. Pinion spline count : 17. You can choose from an extensive selection of ring and pinions from USA Standard Gear to build the differential you want. USA STANDARD GEAR – RING AND PINIONS. [[Stock #]] M2386-ASHOP GM ALL USED PARTS WILL HAVE NORMAL WEAR AND TEAR. Quantity sold : Kit. Therefore all implied warranties that may apply to your part are limited to the duration of this written warranty. Each warranty gives you specific rights, and you may have other rights which vary from state to state. .GM ORIGINAL.GM NUMBER 14101520.1985 1986 1987 1988 1989 1990 1991 1992 1993 1994 1995 1996 Corvette C4 Dana 44 rear differential cover, original GM,,GREASY! , We are in Stuart Florida. Because they’re made from high-quality steel and machined to tight tolerances, you can expect long-lasting performance from Yukon Gear & Axle’s differential carrier cases. They’re available in a long list of sizes to suit your vehicle’s needs. 2015 corvette c7 differential diff in good working order PART NUMBER 23255926. For sale is one used positraction rear end differential. Case Stamp Code: OA (3.08:1). This is a used differential and is considered a CORE which may or may not need to be rebuilt. This diff should be inspected by a TRUSTED professional before installation.